A Touch of Stardust by Kate Alcott-I've read several of Alcott's historical novels in the past, but this is the first historical novel I've seen of hers that involves subjects portrayed as natives of the Midwest. Carole Lombard, a native of Fort Wayne, Indiana, rose to fame as a movie star during Hollywood's "Golden Age" of the 1930s and 1940s. Lombard married movie star (and Ohio native) Clark Gable as he enjoyed an apex of his fame while filming the movie, "Gone With the Wind". Julie, the main character in Alcott's novel, comes to Hollywood with dreams of becoming a screenwriter and works as an assistant to Lombard. Julie and Carole enjoy a friendship strengthened by the fact that they both grew up in Fort Wayne, while Julie finds many challenges to her sheltered Midwestern upbringing as she embarks on her screenwriter career and a new relationship with a producer's assistant, Andy, who happens to be Jewish. It's 1939 and Gable is starring in one of the lead roles in GWTW as the fictional characters encounter swiftly changing attitudes regarding anti-Semitism, racism and career women. Mrs. Grant and Madame Jule by Jennifer Chiaverini-This is one of several books from Madison Wisconsin author Chiaverini (other books based on the lives of real women in history include Mrs. Lincoln's Rival and The Spymistress). This story revolves around Julia Dent Grant, the wife of President Ulysses S. Grant, and Jule, a slave who fled to freedom in the wake the Emancipation Proclamation. Cast as a love story between Julia and Ulysses focusing on the very difficult years of the Civil War and the close, and eventually fractured, relationship between the Missouri-born Julia and the young Jule as they grew up together. Julia stayed with Grant until his lingering death from tongue cancer, while Jule found to business success with her own hairdressing and cosmetic company. 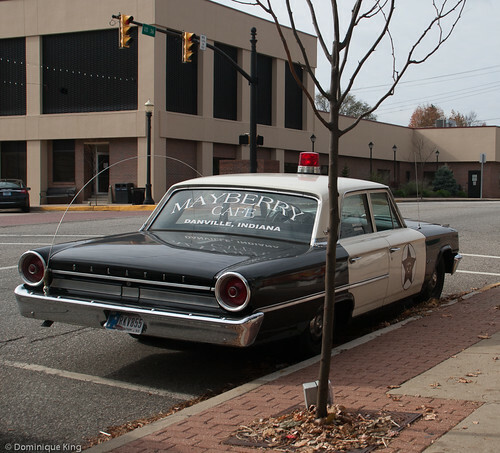 Terror in the City of Champions: Murder, Baseball, and the Secret Society that Shocked Depression-era Detroit by Tom Stanton-The 1930s saw a lot of pain and terror in Detroit even as 1935 saw Detroit Celebrate being the City of Champions with all three sports teams (baseball's Tigers, hockey's Red Wings and, believe it or not, football's Lions) win their respective world championship titles. Detroit's Joe Louis also became the world champion heavyweight boxer at the same time! 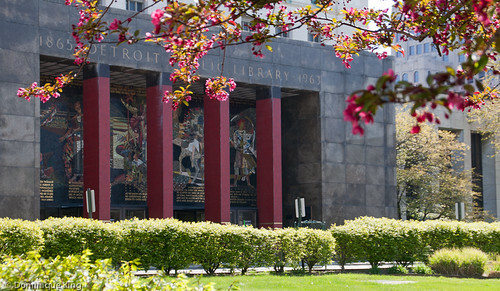 Detroit author Tom Stanton details how Detroit celebrated the sports achievements and an improvement in the Great Depression-era economy even as the city struggled under the oppressive influence of The Black Legion, a secretive racist and xenophobic group responsible for multiple beatings and, in many cases, killings. Folks sometimes cheerfully would cop to being involved with groups like the KKK, but a strict code of silence among members and fear made it very difficult to break or prosecute the Black Legion. The book reminded Tim of Erik Larson's Devil in the White City with a cast of true-life characters that included the bigoted priest Charles Coughlin and other bit players like Henry Ford, J. Edgar Hoover, presidents Ford and Reagan and sports greats from Detroit. Boy on Ice: The Life and Death of Derek Boogaard by John Branch. Boogaard grew up in Saskatoon and moved through youth, Junior and minor hockey leagues to advance to the NHL as one of hockey's fiercest and feared enforcers. I've never been a big fan of fighting in hockey, although many see it as a necessary outlet to help avert further violence in the game. Attitudes slowly changed over the most recent years when guys like Boogaard suffered because of the damage caused by repeated concussions and trauma to the brain caused by blows and on-ice collisions. Boogaard died at the age of 28 in 2011, an event that made headline news in North America and elsewhere. Often wearing the number 24 in homage to his hero Bob Probert, a much-loved hockey enforcer who spent much of his hockey career in Detroit and Chicago, Boogaard's struggled with injuries and illnesses (chronic pain, substance abuse) that mirrored Probert's. Boogaard's family, like Probert's before him, donated his brain after his death to researchers seeking to better understand the problems. The book covers Boogaard's early career in Western Canada as well as his time with the Minnesota Wild and New York Rangers in the NHL. Debate about sports-related concussions continues in the NHL and NFL, and there seems to be more awareness and action to alleviate the conditions and provide better protection for those in sports in the wake of stories like the one about Boogaard. The Val James Story: Black Ice by Valmore James and John Gallagher-Val James was a rarity in hockey during the 1970s and 1980s as a U.S. born hockey player...and as an African-American who become the first U.S. born black hockey player to make it to the NHL. Val James' road to hockey success was rocky at the time as he struggled with the open racism of the time. You'd like to think that things are better for such players these days, but it is still instructive and important to understand the insults and hardships visited upon players like Val. Val's interest and proficiency in hockey began as his family moved from his native Florida to upstate New York in search of a better life and his father became the manager of an arena in Rochester, New York. While Val spent much of his professional life in New York State, Quebec and Erie, Pennsylvania, he did manage to play at least a handful of games in Buffalo, New York, Toronto in Canada and Detroit, Michigan. Check these books out and learn something new about the Midwest and Midwestern culture today! Regular readers of Midwest Guest know that we're huge hockey fans and that we dearly miss the Plymouth Whalers. This season has been particularly quiet on the hockey scene for us as the Plymouth Whalers moved north to Flint, Michigan after the end of last season, which means we no longer have season tickets for games and have been looking for some viable alternatives to allow us to get our hockey fix. We enjoy hockey enough that a well-played game between fairly evenly matched high school hockey teams can be enjoyable, but we've found that there can be a wide disparity between the skill levels from various metro Detroit high school teams and we often end up watching a blow out by one of the teams or, as we did quite recently, see a game stopped after the second period due to a mercy rule that allowed games to be called after one of the teams quickly reaches a 10-point lead. We won't even talk about the fact that high school games have only three 17-minute periods, as opposed to pro teams that play three 20-minute periods and spectators can't get a beer during the games. Enter the Toledo Walleye, a minor pro league of the East Coast Hockey League named after a popular game fish in the Toledo area. When we saw the Whalers, it was an hour's drive both to and from the arena in usually heavy Detroit-area traffic, so we figured making a Walleye trip an overnight would be a relatively easy commute. Toledo is a little over an hour from here, and an overnight allowed us to pick our time of day when to make the drive. The Walleye draw a number of players that previously played in the OHL, so there was also a good chance we'd see some players we'd watched play hockey in the past. Some of them are still young enough that there is a chance you could still see them play in the NHL at some point in the future as well. 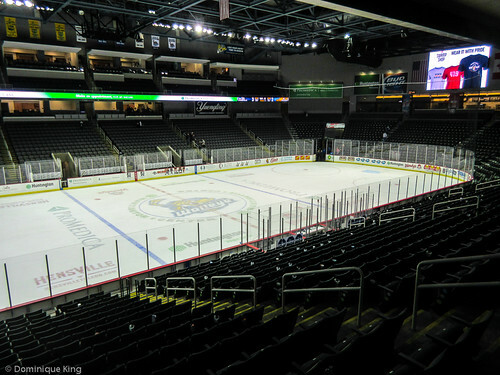 Toledo's team, founded in 1991 as the Toledo Storm, previously played in an aging arena across the Maumee River from Downtown Toledo until suspending operations for two years in 2007 while the team's new owners built a brand new arena right in downtown Toledo. 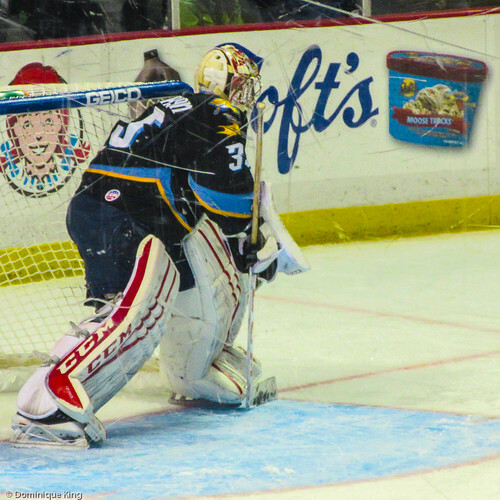 The team resumed playing home games as the Walleye in the new Huntington Center when it opened in 2009. The hockey team's current ownership group is a subsidiary of the Toledo's Triple-A baseball team the Mud Hens, and the arena is just a short walk from the downtown ball park. 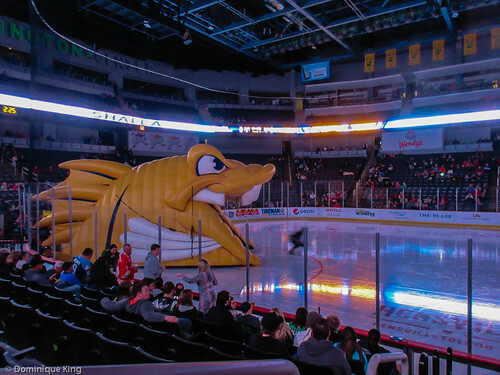 The Walleye also have strong Michigan ties as the team has affiliations with the NHL's Detroit Red Wings and the Grand Rapids (MI) Griffins of the American Hockey League. The Storm enjoyed success over its 16-year history as a T-Town hockey team, and the team continued its winning ways as the Walleye. Their first home game drew a sell-out crowd of 8,000, the largest crowd to watch a pro-hockey event in Toledo up until that time. 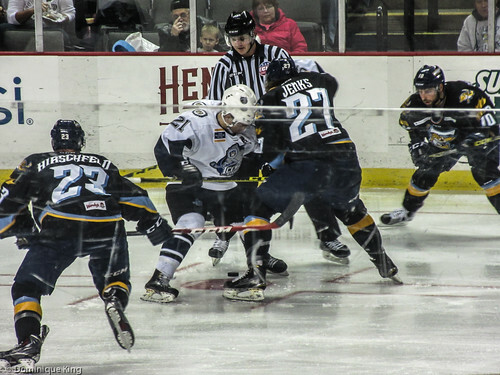 Even though the team lost that game to Florida's Everblades, it won the next two match-ups with the Everblades that weekend, and the team made three appearances in the playoffs during its six year history as the Walleye. The Walleye lost in the Conference Finals during the 2015 playoffs, which I'm assuming is the reason for this year's Walleye tagline-"Our Fish, Our Fight...We've got Unfinished Business to Settle." We checked into the Park Inn, a downtown hotel across the street from the arena on one side, a place we'd stayed in the past as it is also across the street from the Mud Hens' ball park on the other side. The arena has about double the capacity that our former Whalers arena and the game started off with the singing of the Canadian and American National Anthems as did all of the Whaler games we watched over the years. We felt pretty much at home as rink staff inflated the Walleye tunnel for players entering the rink to pass through as the announcers read the starting lineup and the rest of the team as we used to watch the Whalers enter the rink at the beginning of each home game though their own inflatable whale tunnel (we still miss Shooter, though). The Walleye cast of mascots includes Spike the fish and a large blue cat named Catrick who skated around the ice between periods and during warm ups. The big bonus for me? The Walleye arena sells Yuengling beer, a brand I can't buy in Michigan and stop regularly in a Toledo grocery store to pick up some to take home with me. The Walleye roster also included players we'd previously watched in the "O" and we saw former Plymouth Whaler A.J. Jenks and former Saginaw (MI) Spirit goalie Jake Paterson play that evening. The ECHL formed during the 1988-1989 season and more than two dozen teams play a 72-game schedule each season, averaging 4,000-plus fans in attendance at each game. During the 2014-2015 season, the league had 28 former players that played their first NHL game, making a total of 569 former ECHL players who played in the NHL at one point over the life of the league. And how is this for a fun fact? Erin Whitten became the first U.S. born woman to participate in an ECHL game, playing goalie for the Toledo Storm on October 30, 1993 and becoming the first female goal tender to earn a victory in a professional hockey game. She also became the first woman to play pro hockey in a non-goalie position when she played with the Toledo Storm on March 7, 1996 as a forward for 18 seconds against Madison Monsters. Connect with the Walleye on Twitter, Facebook, Instagram, Pinterest, YouTube or by signing up for the team's email newsletter, and get your Walleye wear at the Swamp Shop in downtown Toledo or online. Check out (and even possibly purchase) a photo of Erin Whitten in her Toledo Storm jersey. Also be sure to check out our experiences with the Toledo Mud Hens: Take Me Out to the Ball Game, Yes there Really is a Tony Packos and a story about Moses Fleetwood Walker, a pioneering African American baseball player who became the first African American to play at the Major League level in Toledo during 1884. Midwest Guest readers, those who follow me on various Social Media channels and folks who simply know me well in real life know of my love of hockey and particular affection for the Plymouth Whalers. The Plymouth Whalers are part of the Ontario Hockey League (OHL), a Junior Major team based in the Detroit metro area where many major league athletes started their professional careers as 16- to 20-year-old players. If you follow me on Instagram, you've seen lots of shots from Whaler games, many of them featuring the team's mascot, Shooter T. Whale. 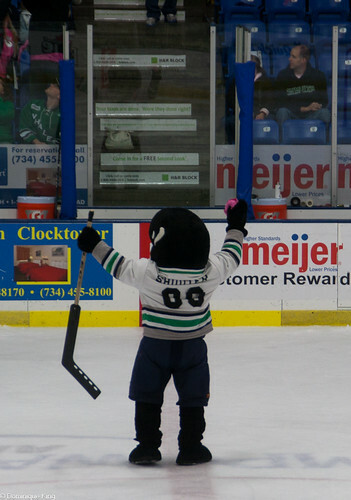 Shooter, born on December 11, 2003 and hailing from the Arctic Ocean, according to a poster I have of him on in my basement stairwell, has long been one of the most visible faces of the Whalers and always has a smile or high five to share with you whenever you see him at a game. We've had season tickets to Whalers' games for more than 20 years, and we've enjoyed every minute of every period of every game, but we've found that, like all too many good things, our relationship with Shooter and the Whalers soon must come to an end. The Whalers started as the Detroit Ambassadors 25 years ago! The team celebration of its 25th season is a bittersweet one as the last few games left in this season mark the end of the team known as the Whalers, which I suppose means that Shooter will soon lose the job that he seems to love so much. Whalers ownership sold the team franchise to a group in Flint, Michigan that will move the team to a new home an hour or so north of here and plan to go forward under a new name. I've long touted the team as a fast, fun, high-quality, affordable and family-friendly alternative to other astronomically priced "Big League" games, but the Whalers never seemed to be able to catch on with a "Hockeytown" crowd spoiled by easy televised access to hockey and what are, for most of us, all-too-rare chances to see a live NHL game. Don't get me wrong, I've long loved the Detroit Red Wings (Tim and I had one of our first dates at the Wings' home opener at Detroit's Joe Louis Arena), but watching the Whalers always gave us an opportunity to see great hockey live at a price that didn't involve something just short of re-mortgaging our house. Watching the Whalers all of these years allowed us to see many great players before they became "big league" players, and I've said that it almost always meant that we had "a dog in the fight" when it came to watching things like the Stanley Cup play-offs whenever the Wings did not make it to the final rounds. One of my favorite memories in recent years of watching the Stanley Cup finals came in 2011 when former Plymouth Whaler Tyler Seguin played with the Boston Bruins during their run to a Stanley Cup. Besides Seguin, we've seen players like David Legwand, Chad LaRose, Pat Peake, Todd Harvey, Robert Esche, Fred Brathwaite, James Wisniewski, Steven Weiss, James Neal, Jared Boll, Chris Thorburn and Bryan Berard at the early stages of their professional careers as Whalers before they made it as players for the National Hockey League. We're very sad to see this era of our hockey-loving time end, but we'll always remember the team and look for players as many of them move forward into the NHL. We wish all of the best for the players and all of the folks that worked for the team that gave us so much pleasure over the years. For Shooter, who the arena announcer always introduces as "The killer whale without a tale", we bid a fond farewell as we thank him and his team for so many hockey great memories. I always love the approach of fall with the seasonal opening of local cider mills, the changing colors of the leaves, the great harvest at the farmers' markets, the cooler weather and the anticipation of a new hockey season! We're big fans of the Ontario Hockey League's Plymouth Whalers, a Junior Major team of skilled 16-to-20-year-old hockey players embarking on what they hope will be a long and successful careers as a professional hockey players. The Whalers start their 25th regular season later this month, with their first home game happening on September 27 as they take on the Erie (Pennsylvania) Otters at the Compuware Arena in Plymouth, Michigan. 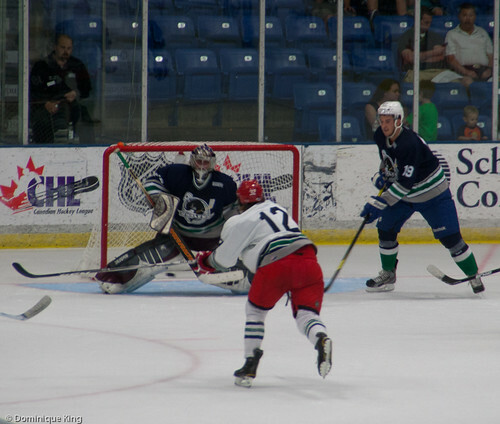 There are a couple of pre-season contests and scrimmages each year, but one of our favorite pre-season events is the Whalers' alumni game that happens every other year. 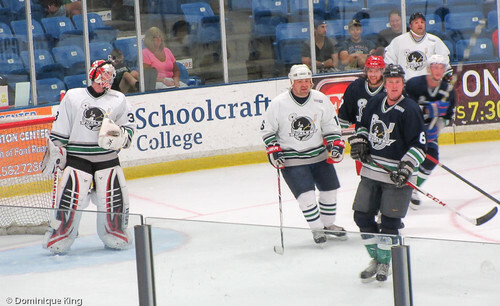 This was the fourth semi-annual alumni game for the Whalers. 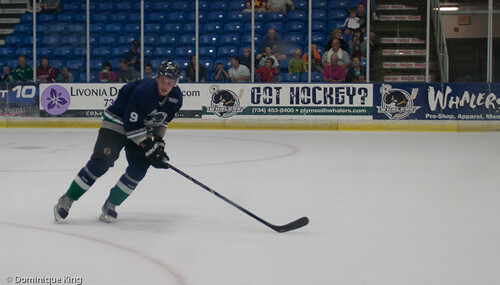 This year's alumni game happened at Compuware Arena on August 16 with Team Blue besting Team White by a score of 8 to 7. This was despite the best efforts of the game's referee to force a tie score in regulation in order to set the stage for a shoot-out, just as the alumni contest that happened two years ago ended. Still, the scores in these contests are never really important as the real winners include: the former players who get a chance to re-connect with their friends, long-time fans and billet families who hosted them during their time with the Whalers; long-time Whaler fans who love the chance to catch up with their favorite Whalers from years past; and the Children's Miracle Network at Beaumont Hospital, which received the proceeds earned from the game that day. These games always seem like such good-natured matches, judging from the smiles you see among the players on ice, and they're a lot of fun for long-time fans like us. The Whalers field two teams of players that always seem to include a few former Whalers who still currently play for National Hockey League teams. I especially love seeing players who I enjoyed seeing during the early-to-mid 1990s like Dan Pawlacyzk (1993-1997) and Mike Morrone (1994-1997) and players that I admired as great skaters during their days as Whalers like Tyler Seguin (2008-2010) and Alex Aleardi (2010-2013). There are always a few players currently signed to NHL teams that manage to come on back to Plymouth for the game as well. This year, players currently in the Big League at the game included David Legwand (Ottawa Senators), Brett Bellemore (Carolina Hurricanes), Tyler Seguin (Dallas Stars), Stefan Noesen (Anaheim Ducks) and Matt Hackett (Buffalo), who is recovering from an injury but came out the cheer for the on-ice crew and mingle with fans at a pre-game autograph session. Goalies Scott Wedgwood (2008-2012) and Bill Ruggiero (1999-2000) each faced nearly 50 shots on goal during the two 25-minute game halves. Wedgewood wore a camera strapped to his helmet to record the action at ice-level, and the two net minders split their duties by playing by alternating playing for each of the Blue and White squads. The lack of blocking shots and the unpredictability of knowing the current playing styles of players who haven't played together on a regular basis made for a high-scoring game. Goal scorers included: Seguin (2008-2010), Bellemore, Legwand, Noesen and Kevin Holdridge (1996-1999). Alumni who came in for the game included: Ruggiero, Shaun Fisher (1997-2000), Jason Lawmaster (1995-1998), Holdridge, Noesen, John Vigilante (2002-2006, and currently an assistant coach for the Whalers), Myles McCauley (2008-2010), Legwand, Mike Yovanic (2007-2009), James Livingston (2009-2011), Aleardi, Rob McBride (2000-2002), Wedgewood, Bellemore, Andre Robichaud (1998-2002), Seguin, Pawlacyzk, Joe Byrne (1996-1998), James Ramsey (1998-2001), Damian Surma (1998-2002), Morrone, Robbie Czarnik(2009-2011), Chris Terry (2005-2009), Hackett, Jamie Lalonde (1997-2000) and Jared Newman (1998-2002). You can catch up with the pro careers of former Whalers who are also current NHL players or NHL alumni here. 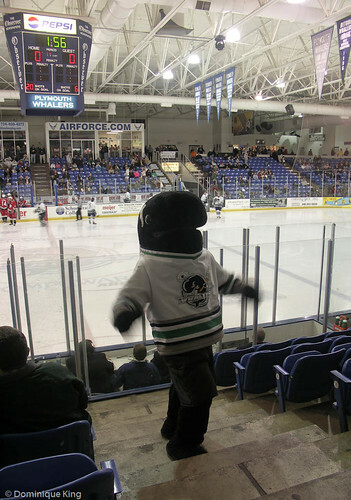 Whalers hockey is great hockey and family-friendly entertainment at an affordable price. You can score individual game tickets online or at the arena box office in Plymouth. The team also offers season tickets (we've got great seats center-ice) or a nice selection of mini-plans, Family Value Packs and group outing options. Download the Whalers app for scores, standings, news and more. Connect with the team on Facebook or via Twitter where the Whalers often post trivia questions and interact with fans during games (I'm still trying to perfect my Smart Seat Tweet trivia form as I'm not the speediest with a phone keyboard, although I managed to nab a trivia prize once during a game last year!). A stone tepee I spotted at the corner of a state highway and a county road near Munising, Michigan reminded me of some structures I'd seen elsewhere in the state as remnants of the work of the Civilian Conservation Corp during the 1930s. There was a good reason for that! We passed the monument multiple times over several days as it sat along the route along a county road we had to take in to Munising from a small resort about 10 miles out of town where we stayed this past summer. Naturally, I had to stop and take a closer look at the monument. This monument, built in 1931 by brick masons that included members of the CCC, commemorates the dedication of the original Hiawatha National Forest. The government largely acquired the original Hiawatha Forest between 1924 and 1931, with President Herbert Hoover designating a large tract of land between the towns of Rapid River and Manistique on Lake Michigan to Munising on Lake Superior as a national forest. Today, this land pretty much comprises the Western Unit of the Hiawatha National Forest. Meanwhile, the U.S. Government administered Marquette National Forest, dedicated by President Teddy Roosevelt in 1909, with the Huron National Forest as the Michigan National Forest from 1918 until 1962. 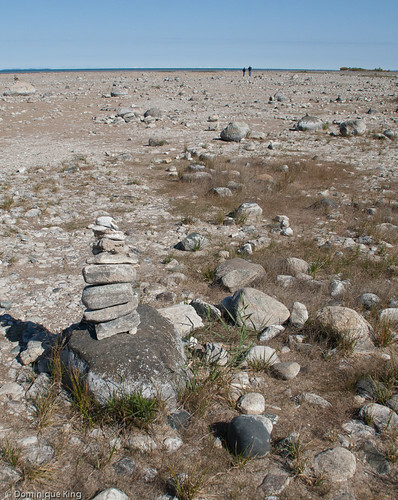 This land, between Lake Ignace on the Straits of Mackinac and to the shore of Lake Superior just west of Sault Sainte Marie became part of the modern-day, million-acre Hiawatha National Forest as its Eastern Unit in 1962. The stone tepee pre-dates the merger of the forests, and was the first of many CCC activities in the area. 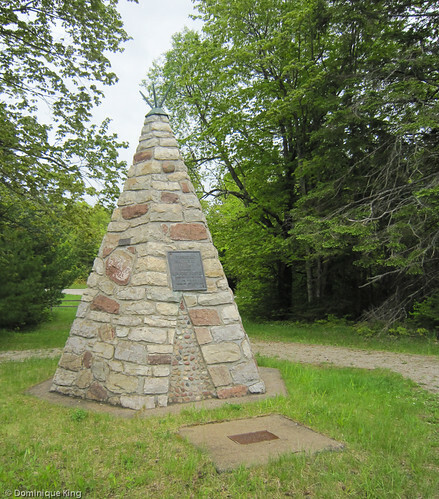 Marquette architect D. E. Anderson designed the monument in the shape of an Ojibwa tepee with bronze tepee poles rising through a bronze cap atop the pyramidal structure of stones characteristic of the region's geology. 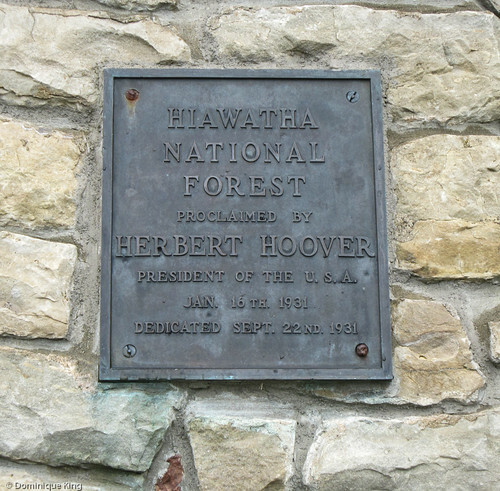 The monument also has a bronze plaque noting Hoover's dedication of the forest and the date, as well as plaques bearing the names of the counties covered by the original Hiawatha National Forest. The CCC started work at the original Hiawatha Forest in earnest a couple of years after the dedication. CCC workers planted a stand of red pines south of the monument in 1935. In 1979, the park thinned the 11-acre tree plantation as part of a timber sale. Camp Wyman sat about .7 miles east of this intersection of present-day highway M-94 and Forest Road 2254 (also known as Buckhorn Road). The camp, founded in late 1933, was home to CCC enrollees who trained in skills like tree planting and fire fighting under the supervision of experienced local men. The CCC crews also worked on hazard reduction, telephone line construction and forest inventory during their time at Wyman. The CCC abandoned seven camps in Michigan's Upper Peninsula that included Camp Wyman in early 1936. Little trace of the camps remains today. 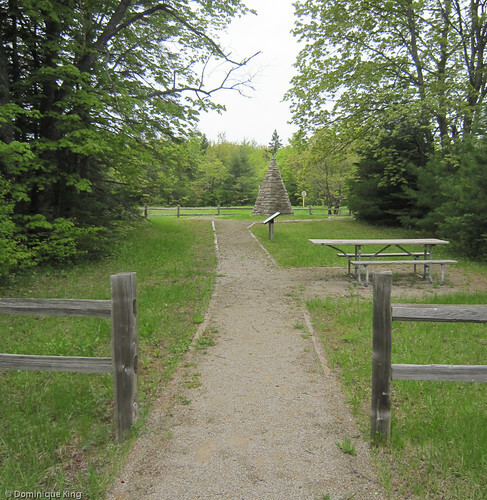 Check out the Hiawatha National Forest's site for a scenic route listing this marker, Camp Wyman, and several other CCC-related sites in the park. 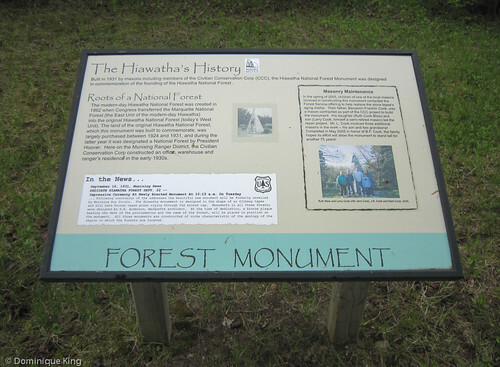 The Hiawatha National Forest has many other attractions, including lighthouses, waterfalls, abundant spring wild flowers, wildlife to look for and five National and Scenic Rivers. 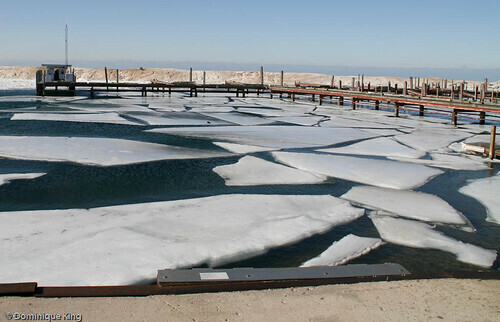 The area, especially around Munising, has an especially excellent reputation as a premiere place to go for winter sports like cross-country skiing and snowmobiling. 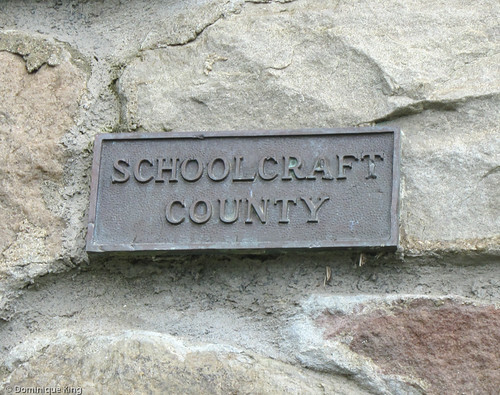 Meanwhile, the legacy of the CCC and its work at Hiawatha National Forest lives on as children and grandchildren of one of the CCC brick masons who built the original stone tepee offered to repair the aging monument with its deteriorating mortar. Mason Benjamin Franklin Cook worked on the monument in 1931. His children, Ruth Cook Blow and Larry Cook (a semi-retired mason himself), enlisted the help of Larry's three sons to complete the repairs in 2005. Interested in learning more about the work of the CCC and the CCC camps in Michigan? Check out Proud to Work: A Pictorial History of Michigan's Civilian Conservation Corps by Annick Hivert-Carthew. 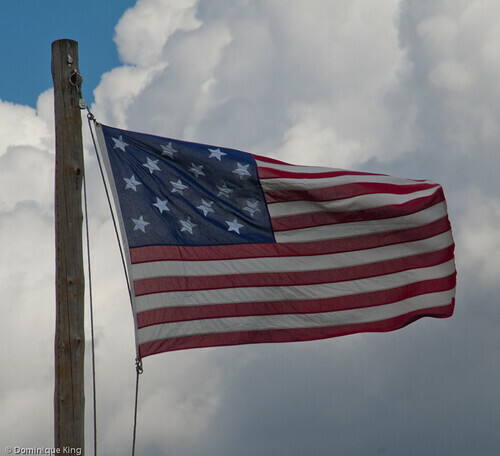 Ohio's northern lakeshore becomes a hot spot for living history this summer as celebrations leading up to the 200th anniversary of Commodore Oliver Perry's great victory at the Battle of Lake Erie kick into high gear this spring and summer. Perry's great naval victory in September of 1813 was a major battle in the war and a turning point in the war for Americans as they gained control of Lake Erie. 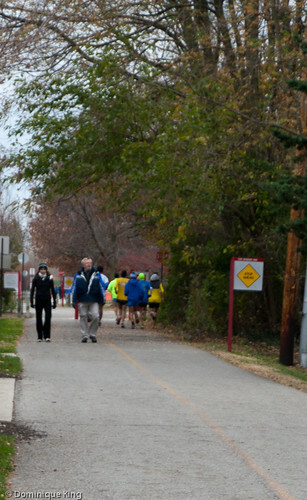 Check out my latest story at the Ohio Tourism Division's Discovering Ohio blog this month, Battle of Lake Erie Bicentennial Celebration, the first of a two-part preview of some of the more interesting events planned to celebrate this historical bicentennial. 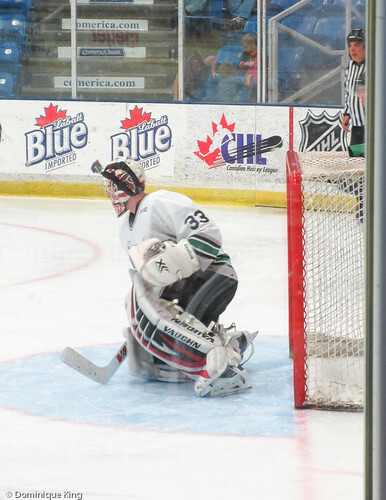 The end of August means summer is nearly over, but it also means that metro Detroit's Plymouth Whalers will soon return to action at the Compware Arena for their regular season home opener against Belleville (Ontario) on Saturday, September 22. The Whalers are part of the Ontario Hockey League (OHL), a Junior Major team where many major league athletes start their professional careers as 16- to 20-year-old players. 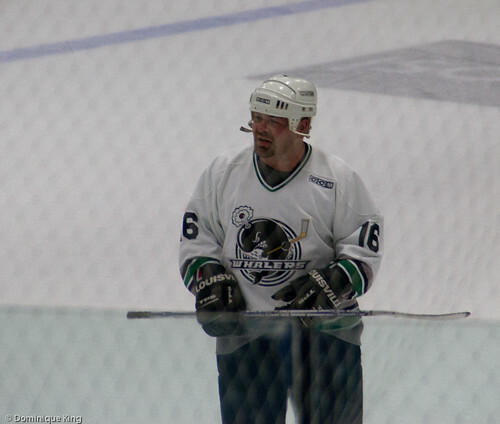 It's fun to read about the pro careers of many former Whalers we remember from more than 20 years of watching the team, but the team offered an especially fun an unique way to catch up with some of our favorite former players earlier this summer with an alumni game featuring a roster of players from across more than two decades of Whaler history. Team White won the August 4 game lasting two 25-minute periods over Team Blue, 11-8, but Team Blue bested Team White during the post-game shootout, 4-2. Check out Scott Merryfield's SmugMug page for some really great images from this game. The game, staged as a fund raiser for Gleaners Community Food Bank of Southeastern Michigan, was a whole lot of fun for the players (judging from the smiles I saw on some of them as they played the game) and fans, who gave the players a standing ovation at the end of the post-game shoot out. 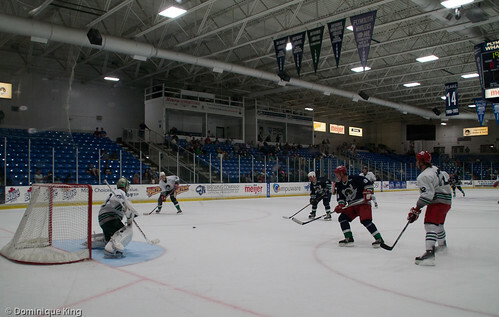 Score tickets for the team's 2012-2013 season at the Whalers site, which offers a number of promotional deals like $5 Friday games and Family Value packs that include tickets, hot dogs or pizza slices, pop and lineup flyers. You can also connect with the Plymouth Whalers on Facebook or via Twitter, where the Whalers often post updates and answer questions during the games, plus you can chat with other fans (yes, I've been known to do a little tweeting during games! ).